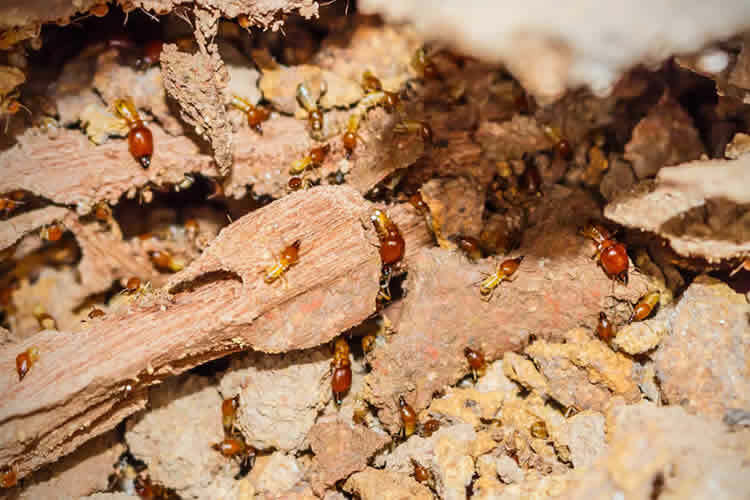 It’s understandably upsetting if you see any of the above signs of termites in your home. Don’t delay if you do though and get a pest control company to your home as soon as you see a sign of termites so you can work on a termite treatment to rid your home of these destructive insects. Barefoot Mosquito & Pest Control guarantees complete termite eradication. Give us a call at today or request a free quote online! One of the worst fears for many homeowners is termites. These silent invaders can steadily eat away at the very structure of your home. It’s important to watch for signs of termites so you can stop them before too much damage is done. Taking care of a termite problem is not something you can easily do yourself, but it is something that, when handled quickly by a professional pest control company, can be managed. All structures are at risk for termites. Even structures built of stone or brick have structural supports that are most likely built of wood. Watch for these telltale signs that you likely have termites. Termites will emerge from the ground as winged insects, most likely on a warm day in the spring or early summer. Their emergence happens as a swarm, and it happens quickly. If you see it happen, that’s a sure sign you need to call a pest control company. However, many people never see the swarm. That’s why it’s important to look for what the termites leave behind during their swarms – their wings. Termites intentionally twist their wings off after they land during this swarm phenomenon because they will never need them again. You can find their wings by your windows or in your basement. Their wings are all the same size, while the wings of flying ants are all different sizes. It’s a good idea to periodically walk the perimeter of your home and inspect wooden sections for hollow wood. Termites eat wood from the inside out, so as you tap the wooden sections of your home, listen for a hollow sound. If you hear the dreaded sound, contact a pest control company immediately. Termites never stop eating, and they can do a lot of damage in a short amount of time. Swift action is imperative. Termites build tunnels so they can travel from their nest to their food (the wood in your home). These tunnels are about the width of a pencil and are found along interior and exterior walls. If you find a mud tunnel, remove a section from the center. Watch for termites crawling out of it, and keep an eye to see if the section is rebuilt within a few days. If you see either of these signs, you can be certain you have active termites in your home. However, this isn’t a failsafe test, as the insects might abandon the disturbed mud tubes and build new ones somewhere else. Laminate flooring that’s affected by termites will often blister or sag in certain areas. Your floor may feel more spongy in certain areas as well. Termites eat cellulose in the timber of walls. If you have unexplained cracks on the inside walls or your ceiling, it may indicate termite activity. If termites are in your doors or window frames, they’ll be creating tunnels. These tunnels, along with all the eating the termites are doing, can cause your doors and frames to become misshapen. If the doors and windows stick, it’s a good idea to look into the possibility of termites. Termite droppings, or frass, are a sure sign you have termites in your home. And not only are they in your home, they’re busy eating and digesting your home. If you have a termite problem in your home, don’t attempt to get rid of them on your own. Call in professional help. The professional termite exterminators at Barefoot Mosquito & Pest Control are knowledgeable and experienced and will implement the most effective method of getting rid of termites in your home and keeping them away long term. Call us today at 512-400-2008 or request a termite extermination quote online.